Last week a group of us got together to assemble invitations for a fundraising event and I offered to bring the lunch. I made Ina's Chicken Salad Veronique and Parmesan Popovers that are so easy to make. 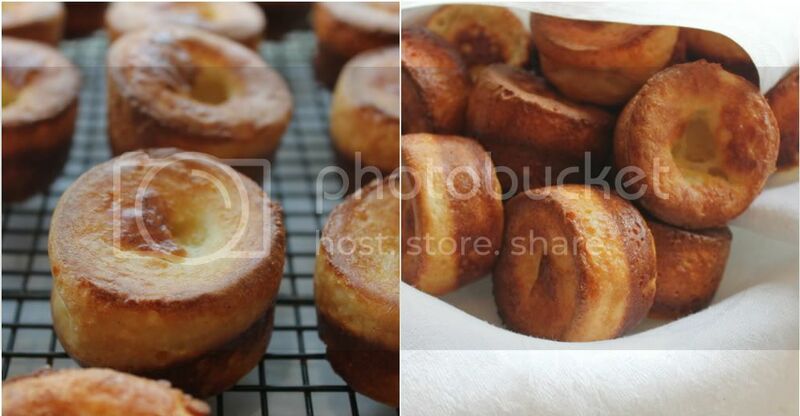 All of the ingredients for these popovers goes into a blender which makes it very easy to pour into mini muffin tins. While my popovers baked I loaded the chicken salad and arugula, jar of roasted walnuts into my largest boat bag lined with clean dish towels. and there was enough to save a little for lunch over the weekend. Our Southern California weather has been summer like so we moved the table out of the sun and dined outside. Both look awesome. I love chicken salad that has an element of sweet. I usually add a little bit of diced apple. I could live on it. What a simple, elegant and delicious looking spread! Your serving spoons are lovely, by the way. Are they family heirlooms? Hi Annie! Your lunch looks fabulous and the perfect ladies lunch. I think just about everyone loves popovers. I have never had a person turn one down in my house, and when my daughter brings a leftover one to school for snack, she only gets one bite as her friends swarm in for a taste. Sometimes I make them fresh for an after school snack for the kids. They love them warm out of the oven. Also the house smells so good when the popovers are cooking. I wanted to let you know that my girlfriend is making your beef stew tonight. I told her to leave a comment letting you know how it turned out. She is not one to leave comments, so if she doesn't, I will let you know what she thinks. Yum,this looks delicious! You can't go wrong with one of Ina's recipes. Beautiful pics too. you've really inspired me Annie! Hope that your fundraiser is a success. i can't wait to try this recipe!!! thanks for sharing:) hope you have a wonderful week ahead! Thank you for stopping by my blog today and for your lovely comment! I would love to see photos of any pleached hedges you spot in the future. They are kind of a garden muse of mine! I have been reading your blog for about a month now. I am in love with your house and am convinced I need to move to the beach. I wanted you to know I tried your recipe for the beef stew today and it was a big success with the family! I was going to make the shortbread cookies but ran out of time. Will save those for another day. Keep on writing and sharing recipes! This is a perfect ladies lunch and I am going to do this. You make it look so elegant and simple. Love the jars. I am saving mine now like you and painting the tops black for my pantry. They look so clean and pretty in there. Love the Valentine's post too! It looks so delicious! yum! Got to love Ina! I love chicken salad...could probably eat it everyday - and yours look so yummy!! Love your presentation!! Love how you effortlessly mix sterling silver with paper plates and plastic forks. Such panache! Want to try those popovers. Snowing in Mammoth, but I am flying down today. Ina knows how to turn invitation assembly into an outdoor party! Love both these recipes and your pictures look like they've been taken by a pro (actually, your food looks like it was made by a top chef, too!) Yummy! Annie...this is wonderful We rely on Ina for nearly everything. I love that we can still watch her show in England. You photos are lovely too...I find photographing food so tricky...you have got it down solid! What a beautiful lunch! I need to try these recipes. They look simple and delicious! Dining outside sounds like a dream right now. It was 20 degrees when I went to the gym this morning. Ouch. By the way, I have never had an "Ina" dish I didn't like. You're a dream volunteer to offer a gourmet lunch at your fundraising meeting! And, so smart to prepare extra for your family. The parmesan popovers look mouth watering. You are wonderful doing this for the meeting! and how did I miss that you are going back to Connecticut?? I consider myself a connoisseur of popovers and those look absolutely beautiful! Two of my favorite things... Ina's chicken salad and popovers! Looks delicious as always. I am reading this and starving! I just tried to bite the screen of my iPad. I'm going to have to try both of these - they look so delicious.